The debate over the pros and cons of the Iran nuclear framework agreement negotiated between the P-5+1 and Iran at Lausanne (April 2, 2015) is simply irrelevant. The search for truth in the conflicting versions and details of the deal coming out of Washington and Tehran is of no consequence. Moreover, the steps suggested by Israel and other critics to improve the efficacy of the deal (by more stringent inspections and so on) will result in little change. The deal is basically dangerous in nature, and needs to be rejected outright. The deal permits Iran to preserve stockpiles of enriched uranium, to continue to enrich uranium, and to maintain illegally built facilities at Fordow and Arak. Even in the absence of a signed full agreement, the US and its negotiating partners have already awarded legitimacy to Iran's nuclear threshold status. In all likelihood, the United States, quite desperate to secure an agreement, will make additional concessions in order to have a signed formal deal – which will not be worth the paper on which it is written. This outcome has been a foregone conclusion since November 2013, when the US agreed to the "Joint Plan of Action" on Iran's nuclear program. Already back then, the US decided not to insist on the goal of rolling back the Iranian nuclear program, ignoring several UN Security Council resolutions demanding no uranium enrichment. Washington also disregarded the security concerns of its allies in the Middle East (primarily Israel, Saudi Arabia and Egypt – who better understand the regional realities). Middle Easterners clearly discern an Iranian diplomatic victory in this accord, which is no surprise. Iranians are much more adept at negotiating than Americans. Iran is getting more or less what it wanted: The capability to produce enriched uranium and to research weapon design; an agreement to keep its missile program intact; and no linkages to Iranian behavior in the region. The deal is a prelude to nuclear breakout and Iranian regional hegemony. With no attempt to roll back the Iranian nuclear program, we are progressing toward the North Korean model. Indeed, with no attempt to roll back the Iranian nuclear program, as was done in Libya, we are progressing toward the North Korean model. Those two are the only options in dealing with nuclear programs of determined states such as Iran. Iran's nuclear program benefited in many ways from assistance that originated in Pakistan and in North Korea (both are nuclear proliferators despite American opposition). Compare the recent statements by President Obama to the speeches of President Clinton justifying the agreement with North Korea (October 1994). Their similarities are amazing; an indication of the incredible capacity of great powers for self-delusion. What counts is not the Obama's administration expression of satisfaction with the prospective deal, but the perceptions of Middle East actors. For example, Saudi Arabia and Egypt have deplored the fact that the US is bestowing international legitimacy on Iran's status as a nuclear threshold state. They probably believe the interpretations of the deal offered by Tehran more than those professed in Washington. Therefore, they will do their best to build a similar infrastructure leading inevitably to nuclear proliferation in the region – a strategic nightmare for everybody. Unfortunately, no better deal is in the offing. Whatever revisions are introduced cannot change its basic nature. The accord allows Iran to have fissionable material that can be enriched to weapons grade material in a short time and Tehran can always deny access to inspectors any time it chooses. This is the essence of the North Korean precedent. It is more evident than ever that only military action can stop Iran from building a nuclear bomb. 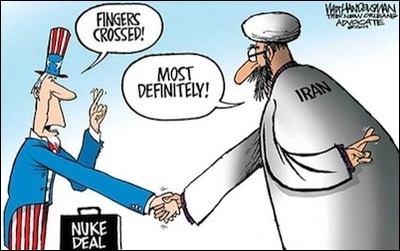 Obama is right that the only alternative to this deal is an Iranian nuclear fait accompli or the bombing of the Iranian nuclear infrastructure. Obama's penchant for engagement, his reluctance to use force, and his liberal prism on international relations (which adds rosy colors to international agreements) have led to this miserable result. Netanyahu is wrong in demanding a better deal because no such deal exists. Yet denying its ratification by the US Congress could create better international circumstances for an Israeli military strike. In fact, criticism of Obama's deal with Iran fulfills only one main function – to legitimize future military action. Indeed, Netanyahu is the only leader concerned enough about the consequences of a bad deal with the guts and the military capability to order a strike on the Iranian key nuclear installations. If inspections, sanctions, sabotage and political isolation ever had a chance to stop Iran from getting the bomb, that certainly is no longer the case. It is more evident than ever that only military action can stop a determined state, such as the Islamic Republic of Iran, from building a nuclear bomb. It remains to be seen whether Israel has elected the leader to live up to this historic challenge.